A strong community, vibrant and healthy, is a community that recognizes the fundamental right of all its citizens to a quality of life that guarantees safety, and the reasonable expectation of health and happiness. Campbell River has turned its attention to this goal by adopting a Charter of Rights for Seniors and a Charter of Rights for Youth. Now we are asking children to help us define what it is that they need to be safe, to be happy, and to be healthy and grow. With their help we propose to add a Children's Charter of Rights to the City of Campbell River. Children as young as three are being consulted. 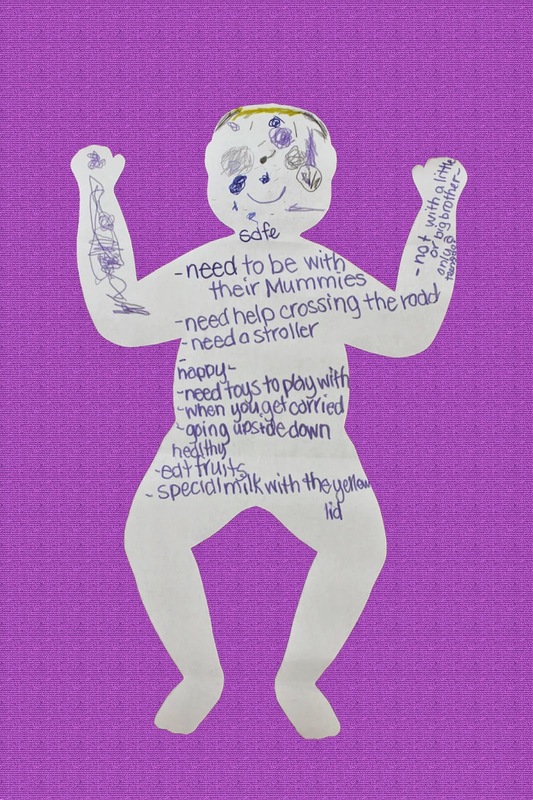 When presented with the silhouette of a baby, young children have been asked what they think this baby needs to be safe, to be happy, and to be healthy and grow. Many of the answers have been both simple and profound. Babies need "their Mummies" and "families to love them". These things keep them safe and make them happy. They need "help crossing the road, not with a little or bigger brother, . . . Well, maybe a teenager". They need toys, and to be healthy they need "the special milk with the yellow lid" and "clean diapers". When shown the silhouette of an older child, they have been asked if these children need anything different than the babies. "Still to be with their Mum!” was a common response. Slightly older children had insightful answers. "Proper housing", "good food", "a family to love", "a good fire department and locks", "clean water", "no pollution", "exercise", and "fruits, vegetables, meat and milk"were a few of their responses. Play has been a common theme. The thoughts of our children are confirming the declaration of the United Nations' Rights of the Child. Our children will guide our own declaration of what we are committed to providing children who live in our community. Contact if you would like more information on the development of the charter, or would like to get involved.